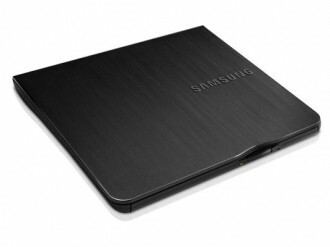 Samsung has announced a new external optical drive billed as the world’s thinnest DVD writer at only 14mm in height. The drive is 18 percent thinner and 8 percent lighter than traditional DVD writers and was built to accompany Intel’s Ultrabooks, which as you know, ship without an optical drive. The SE-218BB optical drive connects via a single USB port that supplies communication and power between the two devices using Samsung’s Smart Technology. The drive is compatible with all major operating systems, including Windows 7 (and we presume Windows 8 in the near future) and Mac. In addition to Ultrabook usage, Samsung tells us that the drive can be paired with supporting Android 3.1 Honeycomb or later tablets to watch DVDs on the go. The optical drive uses a standard array of technology that’s been around for ages, such as buffer underrun prevention. When burning a CD, the drive requires a constant stream of data to be written. If there is an interruption in the data flow, a buffer underrun error will occur. With this technology, the drive is able to store incoming data in a buffer to help prevent such errors. The drive is capable of varying read and write speeds depending on the type of media used: 24X CD-ROM, 24X CD-RW, 8X DVD±R recording, 5X DVD-RAM recording, 6X DVD+R Dual Layer recording, 6X DVD-R Dual Layer recording, 8X DVD+RW recording and 6X DVD-RW recording. Samsung further highlights that this drive is eco-friendly as it uses lead-free soldering that removes harmful materials. Interested parties can pick up the SE-218BB now for $59.99.